Most teachers are familiar with Daily Oral Language, abbreviated as D.O.L. or under the guise of similar acronyms. 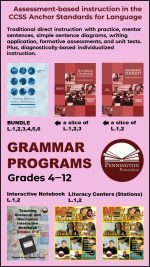 Teachers like the canned program because it requires no teacher preparation, it provides “bell ringer” busy work so teachers can take attendance, and it seemingly “covers” the subjects of grammar, punctuation, capitalization, and spelling. D.O.L. 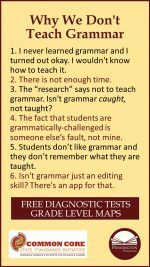 is probably the most popular instructional technique used to teach grammar. 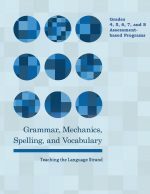 The second most often used technique would be the “teach no grammar-nor-mechanics technique” as is frequently employed by writing process purists who save this “instruction” until the last step of a process piece, if they ever get to it at all. However, the subject of this blog is the former technique, and why D.O.L. does not work. 2. D.O.L. has no scope and sequence. It is random, repetitive, and hodgepodge. Many D.O.L. 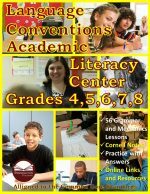 programs claim to offer grade level editions. Who determined that parentheses are at third grade instructional level and semi-colons are at the fourth grade instructional level? 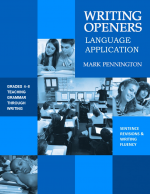 Check out the author’s Common Core aligned grammar and mechanics scope and sequence for one that does makes sense. 3. D.O.L. is implicit, part to whole instruction, divorced from any meaningful writing context. Correction is not teaching, and no D.O.L. 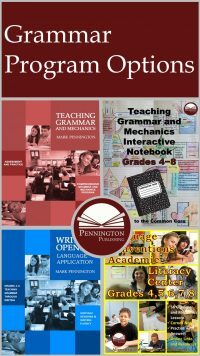 program that I know of has effective teacher prompts to teach the grammatical concepts. 4. D.O.L. 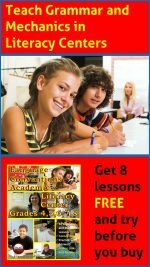 aims to teach writing without writing. Would a seamstress teach sewing by having her students spend all their time analyzing stitching errors? No. To sew, you have to practice sewing. To write, you have to practice writing. 6. D.O.L. is not diagnostic. D.O.L. has too much repetition of what students already know, and not enough practice in what students do not know. 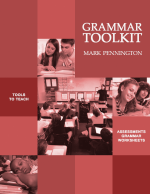 Teachers need to use diagnostic assessments to determine individual student strengths and weaknesses in grammar and mechanics and then use instructional materials to effectively differentiate instruction. 7. D.O.L. rehearses errors and imprints them in the long term memories of students. The more visual and auditory imprints of errors, the more they will be repeated in future student writing. 9. D.O.L. is bad test prep. Although teachers often advocate use of D.O.L. for this purpose, the multiple choice format of standardized tests is dissimilar. Tests generally ask “which is right?” not “which is wrong?” Check out the PAARC and SBAC tests for more. 10. D.O.L. uses bad writing models to teach good writing. It teaches what is wrong, not what is right. Although some error analysis can certainly be beneficial, at least as much time should be spent analyzing what makes good writing so good. Good “mentor texts” (Jeff Anderson) from both professional authors and student authors can teach what students should aspire to and emulate. 11. D.O.L. teaches from ignorance. “If they don’t become familiar with the concepts they are asked to edit for BEFORE they are asked to edit, of course they won’t do it well. How could they? How can you tell if something like a mark is missing if you don’t know where it is supposed to be in the first place?” and “But do we start history class with all the wrong dates and names on the board and ask kids to fix them? What about learning the concepts first (Jeff Anderson)?” Students cannot show what they do not know. 12. D.O.L. doesn’t teach the whys and hows of grammar and mechanics. Math teachers do not just teach the process of long division; they also teach the concepts behind the process, using examples, manipulatives, etc. to provide the “deep thinking” that students need. 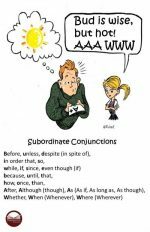 Students need to know why commas set apart appositives, for example. Students need to know how position of word choice affects meaning, for example. 14. D.O.L. does not provide enough practice. One isolated error correction does not teach to mastery. Good teaching involves instruction and immediate guided practice, followed by independent practice with teacher feedback. D.O.L. is throw-it-all-against-the-wall-and-hope-some-of-it-sticks instruction, not the targeted practice that students need to learn and retain the grammatical and mechanical concepts. 16. D.O.L. has little research base to indicate that it works. 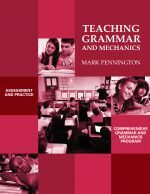 Why use what does not work, when workable, effective alternatives are available for effective instruction in grammar and mechanics?